Cards are a great tool that increase the odds that your acts of kindness will continue on and ultimately create a string of good deeds that all started with you. They are made of hard plastic similar to credit card and fit conveniently in your wallet or pocket. Each card has a unique ID number that allows you to log the card into the website and then track it to see where it goes and who it helps along the way. 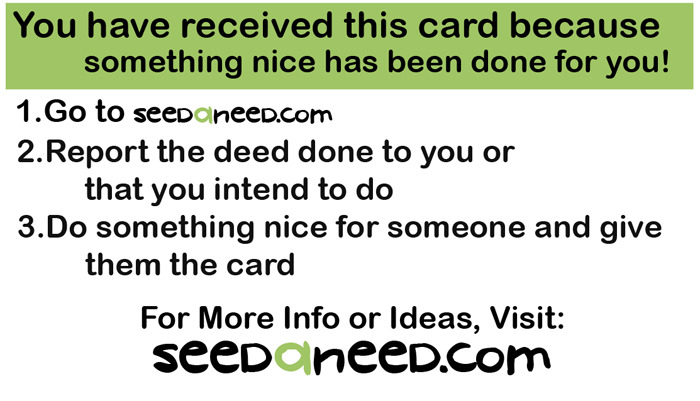 Seed a Need is non-profit. therefore there is no profit to us by selling the cards. We have calculated the card cost and give free shipping in an attempt to achieve a break even on all orders. Any extra surplus is utilized to order more card stock.